Compact Design The VR70 & VR140 are conveniently mounted underhood which saves valuable cargo and work space or the need to tow a trailer, or allow you to tow a trailer for other job site accessories. Light Weight Decreased payload reduces the wear and tear of your vehicle while at the same time increases fuel economy. The VR140 which provides up to 150 CFM and 175 PSI weighs in at only 206 lbs. Underhood Mount VMAC compressors are mounted under the protection of the vehicles hood which limits moisture and corrosion extending the life of the compressor. 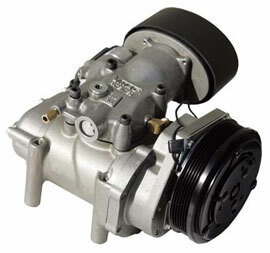 When properly maintained, VMAC compressors should last for the service life of your vehicle. The underhood mounting system utilizes the engines heat during the coldest months of winter preventing icing and ensuring maximum efficiency of the compressor. Loss of time De-Icing your compressor is now a thing of the past. No need for towable air compressors. Your competitor may not be able to tow a heavy trailered compressor to the job site. With your VMAC compressor, if you can drive your truck to the site... you have air. No additional vehicles or manpower required to tow auxillary equipment. Your truck engine powers the compressor. There are no additional engines to maintain or carry additional fuel for. Again saving you time, money and energy. No impediments to mobility through traffic. You can be assured of a little more 'peace of mind' knowing that you or one of your staff are not trying to negotiate heavy traffic, park in precarious situations, and backup when space can be limited.